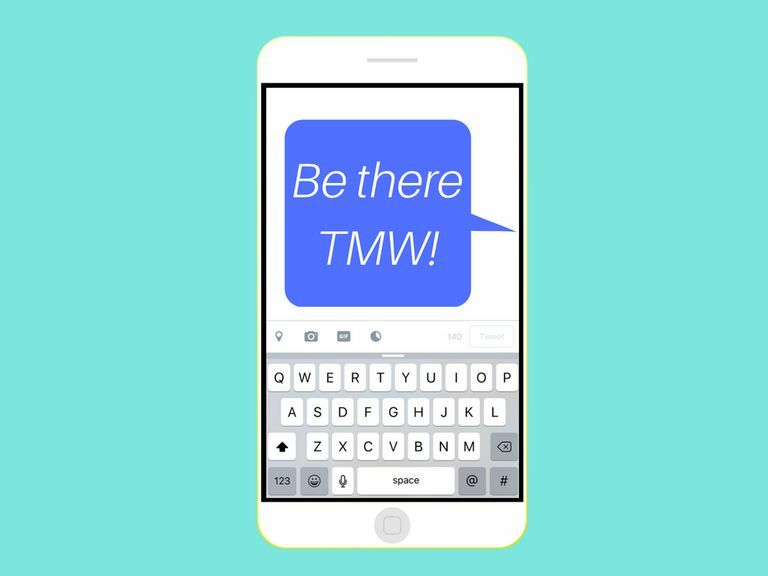 A text message saying "TMW" on an iPhone. "TMW" might look like a simple enough slang term to decode for some people, but for others, its meaning might be as difficult to interpret as anything else. TMW is an abbreviation and not an acronym. In this case, the most unnecessary letters from the word it stands for are discarded except for three of the most important ones: the first letter, one of the middle letters and the last letter. TMW refers to the next day after today. Instead of typing out the whole word "tomorrow," TMW offers people a faster and convenient short-form version that they can text or type online to save them both time and energy. TMW is used in text conversations or online exactly the same way that it's used in real life. Since it's such a simple abbreviation that many people can often interpret correctly just by taking message context into consideration (even when they may have never seen it used before), it's one of the most popular slang terms used widely today. make predictions or forecasts for the next day. Friend #1: "I'm going to the gym tmw for 8am, wanna come?" In this first example, TMW is used to state plans for the next day. Friend #1 explains what they'll be doing and asks Friend #2 if they'd like to make the same plans in order to join them. Friend #1: "The test tmw is going to be brutal"
Friend #2: "I know, I'm pulling an all-nighter to study"
This second example shows how TMW can be used when discussing the next day's upcoming events. Friend #1 uses it to bring attention to a test scheduled for the next day. Friend #1: "I think it's supposed to rain tmw"
Friend #2: "Yeah, we might have to postpone the bball game"
In this final example, TMW is used to refer to a prediction or forecast. Friend #1 uses it to state potential weather conditions for the next day. There are lots of different slang terms that are used to represent the word "tomorrow." TMW is just one of them that's arguably a little more popular than some of the others, but you might want to brush up on your knowledge of these variations just in case you spot one somewhere in the wild. TM: You don't necessarily need that last letter W. This is the shortest abbreviation of "tomorrow." TMR: Some people like to use an R at the end rather than a W. Use the one that you think is easiest to interpret. TMRW: If you can't choose between an end letter for this abbreviation, why not use both? It's longer by just one letter yet might make more sense. 2MR: Instead of starting this abbreviation with a letter T, you can slang it up more by using the number two. Tomora: This slang term alters the sound of the word to give it a very casual, conversational tone. Now that you know one of the most popular ways to say "tomorrow" online or in a text, you might be interested in learning how to refer to other time periods in similar ways. Check out some of the following time period abbreviations and acronyms that you can add to your texting/online post vocabulary.